Kiku-Masamune Sake Brewing was founded in 1659, when Japan was ruled by Ietsuna, the fourth Tokugawa shogun. Customers simply do not tire of drinking dry Japanese sake that has been brewed using the same Kimoto method since the Edo period by Kiku-Masamune’s master brewers, who have taken great pride in honoring the brand’s tradition of brewing only dry sake. Going forward, Kiku-Masamune remains committed to this single-minded pursuit of dryness. Smooth, dry sakes that lack both intense flavor and the aftertaste of lingering sweetness so that you never tire of drinking them not only preserve the flavor of the cuisine, but indeed whet your appetite for it. Kiku-Masamune strives to craft exactly this type of authentic dry sake, which complements cuisine and stimulates the appetite. This type of sake brings out the distinctive flavor of delicate Japanese cuisine so that you can enjoy the natural, unadulterated taste of each ingredient in dishes such as soba, sashimi, and sushi. It is for this reason that Kiku-Masamune is loved as an accompaniment for cuisine. Kiku-Masamune has long used only Yamada-nishiki brewer’s rice as the most basic ingredient for its sake, the result of a stubborn dedication to exceptional quality. Yamada-nishiki is a type of sake rice, or shinpaku-mai, that is characterized by a larger grain size than normal rice varieties, low protein content, and a soft consistency that allows the yeast to more easily penetrate the rice. Furthermore, this variety’s thin surface layer of bran, which makes it easy to absorb and digest but hard to husk during the milling process , is ideally suited for use as sake rice. 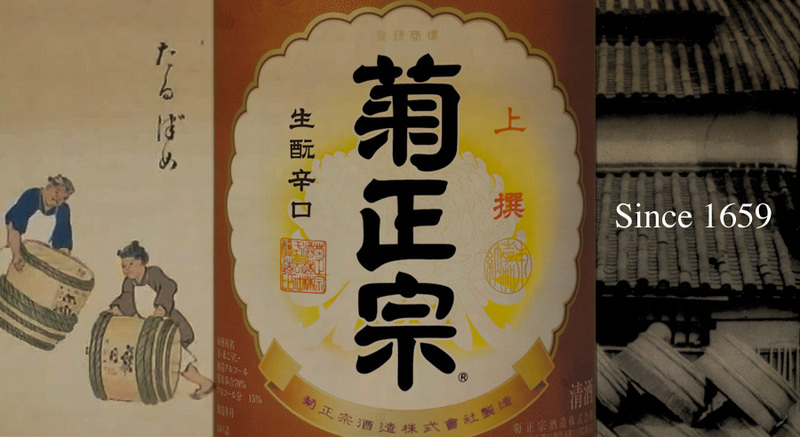 Authentic dry sake is the essence of Kiku-Masamune’s approach. It would be impossible to bring about the refreshing, robust flavor of this sake without the mystical flavor of Miyamizu water. Miyamizu water contains almost no iron yet is rich in minerals such as calcium, potassium, magnesium, and phosphorus. This mineral content provides nutrition for the yeast as well as a variety of other microbes, driving a healthy, robust fermentation process to create refreshingly dry sake as only a brewing process charged with hard water can. It is the authentic Kimoto method for brewing sake that produces the smooth, dry character of Kiku-Masamune’s sake. This painstaking technique, which constitutes the very origin of sake-brewing, comprises an ancient method for creating moto (shubo), the yeast starter mash, that will ultimately produce the alcohol in the beverage from water, rice, and malted rice (koji). However, due to the fact that this approach, which takes four weeks from start to finish, consumes about twice as much time and effort as the normal method and requires a technique that is extremely difficult to accomplish in a stable, consistent manner, only a very few of more than 1,000 sake breweries in Japan employ it.